I finally managed a step-by-step post for making yogurt at home. Yogurt (or yoghurt or curd or dahi in hindi) is one of the essential ingredients of Indian cuisine and I’ve been making it almost every day for the last 8 years but was never able to click photos at the right moment. Now I have also started making vegan yogurt using soy milk and almond milk using the same recipe. Yogurt is an essential part of Indian cuisine. Be it as is for breakfast, as a simple raita, kadhi, lassi, as a marinade, or in a gravy. 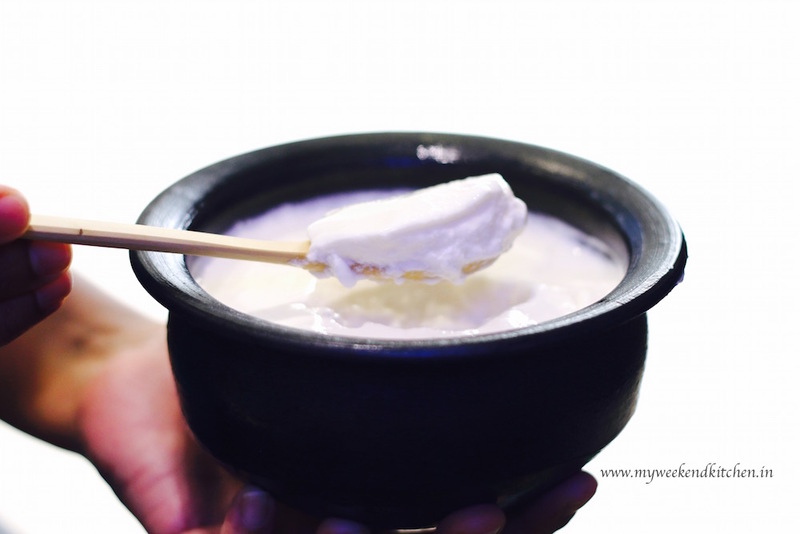 While yogurt is now readily available in shops,in India since ages our mothers and grandmothers have been setting yogurt at home. Every night mom would set a covered pot on kitchen counter and remind the whole house not to disturb it. In the morning sweet home-made yogurt will be ready. I used to feel like it’s magic! And everyone can be that magician who make her own yogurt at home. Even now after so many years of making yogurt myself, every time that I put the spoon into a fresh bowl of set yogurt, it fills me with excitement. For some of my expat neighbours, yogurt has always been bought from stores or if made at home it needs a special yogurt maker. But making yogurt at home is very easy and needs no special equipment. All that is needed is milk, a little starter yogurt and patience. I hope this step-by-step process with pictures for homemade yogurt is clear. I keep making some in small jars for my neighbours and when I show them how simple it is, they are always amazed. Wait… a couple of points before we start with the steps of homemade yogurt. There are only two ingredients so the final output entirely depends on those two. Full cream milk makes a thick-creamy yogurt. It is also best if you are making yogurt to make cheese like labneh at home. Yogurt is a living food with active cultures, so the best results will be if the starter yogurt also has active cultures. If you are using shop bought yogurt as starter, make sure the packet mentions active cultures. 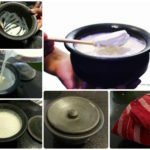 Making yogurt at home is very easy and needs no special equipment. All that is needed for homemade yogurt is milk, a little starter yogurt and patience. I hope the step-by-step pictures are helpful. In a sauce pan, bring milk to a boil and then keep it aside for 10-15 mins until it is lukewarm. You may choose not to boil the milk but just warm it till it is lukewarm. My test for temperature is to put my finger in milk and if I can keep it in the milk for 10 seconds it is good. Take 2 tbsp of starter yogurt and spread on the inside of a bowl. I use a ceramic bowl for setting yogurt but you can use a glass or steel pot as well. If the weather is very cold, warm your pot by keeping it in microwave for 30 seconds at medium power. Pour in the lukewarm milk. Mix well so that the yogurt is mixed in evenly. Cover with a lid and then enclose in a tea towel and leave the pot undisturbed in a warm place. When the yogurt is set, remove the tea towel and keep the bowl in fridge. It stays good for upto 2 days and after which it will start to become sour which is perfect if you want to make some delicious kadhi! The time taken for yogurt to set will depend on the ambient room temperature. In temperatures around 30ºC, it takes about 4 hours for yogurt to set. Start checking the pot after 4 hours, every half hour to see if it has set. If you keep it outside for long, the yogurt will start to become sour. In Abu Dhabi, where the temperatures are very high, it used to take just about 3 hours for the yogurt to set. In Scotland on the other hand where it used to be cold most year round, I used to preheat the oven to about 50ºC and then switch it off before putting in the yogurt inside the warm oven overnight. You can also make flavoured yogurt by adding sugar, vanilla or fruit extract of your choice to the lukewarm milk. 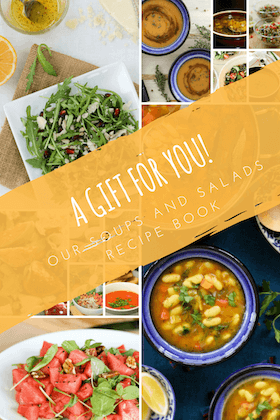 I feel food is the best gift. 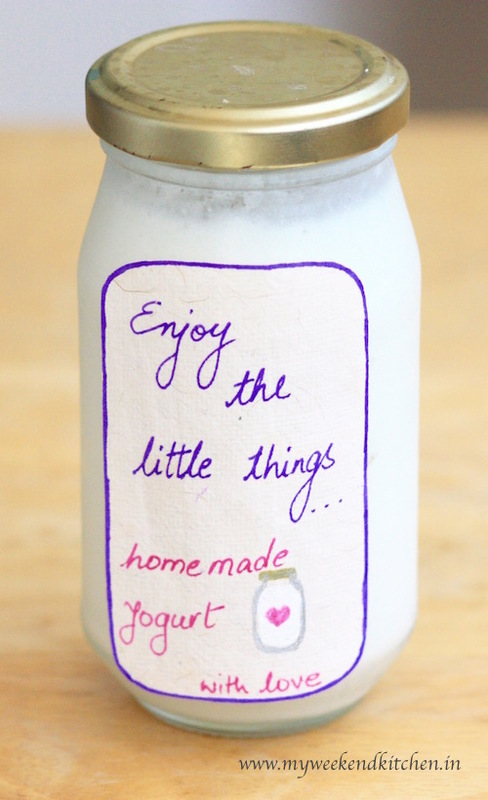 Quite often I set yogurt in small glass bottles (recycled from jam/ mayonnaise etc) and leave it at my neighbours’ doorsteps as a little delight :). 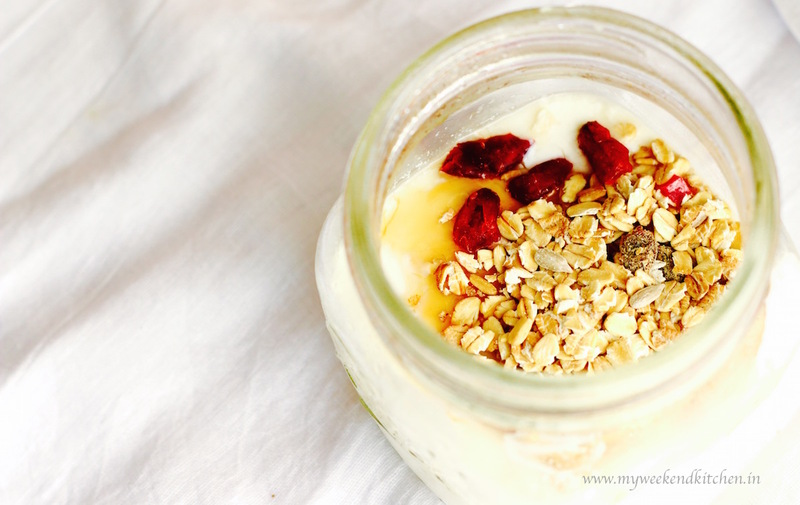 Do you make your own yogurt? What are your tips for setting the most delicious yogurt at home? I loved it! I did the extra step and I strained it to make a more thick yogurt. Thanks for explaining the different times in different countries! I wonder if I can use flavoured yogurt as a starter. 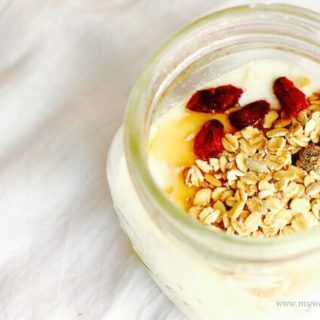 I am so glad you tried the recipe and that it worked well for you 🙂 You can add different flavors while setting the yogurt… I’ve tried adding some jams and fruit compote to the yogurt and milk mix while setting and it sets fine. While I haven’t tried using flavored yogurt to set yogurt yet, I don’t see a reason why it should not work 🙂 Do let me know how it goes!